Two-time Olympic gold medallist Rebecca Adlington says not being able to compete with the new younger generation of swimmers has led her to retire from the sport at the age of 23. Adlington became Britain's first female Olympic swimming champion in 48 years, with victories in the 400m and 800m freestyle at the 2008 Beijing Olympics. but won bronze in the same two events at the 2012 London Olympics, losing out to 15-year-old American Katie Ledecky in the latter race. 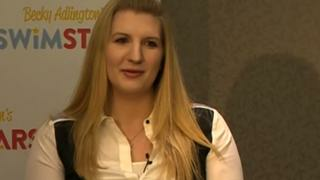 Adlington said she had always intended to "finish on a high" after competing in an Olympic Games in her home country, and will encourage youngsters to take up swimming through her "Rebecca Adlington Swim Stars" programme.